It all started while I was walking along the Old City and saw this palatial presence on the street that resembled a luxurious boutique hotel. It turned out to be a spa resort. 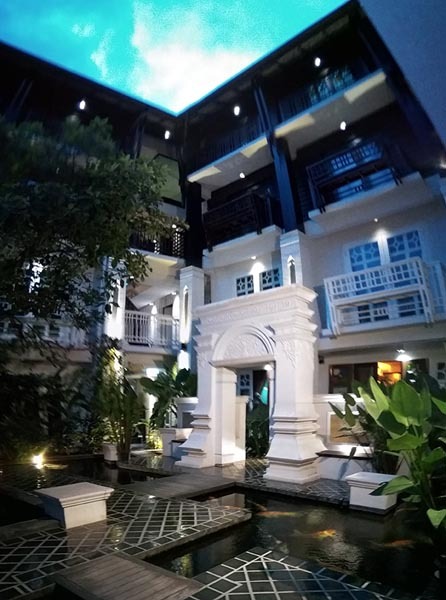 Given its size, opulence and ostentatious appeal, I wouldn't be surprised if it's Chiang Mai's best and most expensive. I walked in and talked to its affable manager, Mr. Un. After a short talk, we shook hands on a barter deal that included a lavish pampering for me and Mike on any package they have on the menu. Whoa! 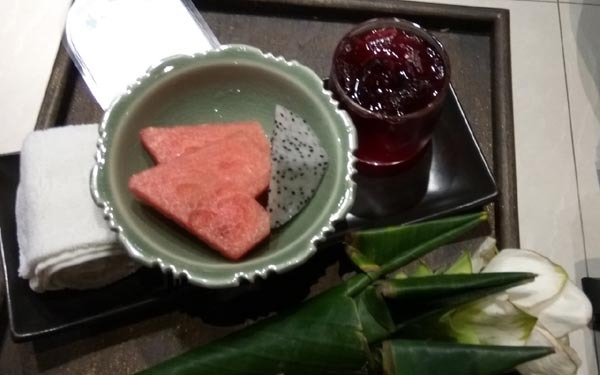 After booking, Mike and I went to Zira Spa where a fruit plate welcomed us. Nice touch! We scanned what's on the menu. 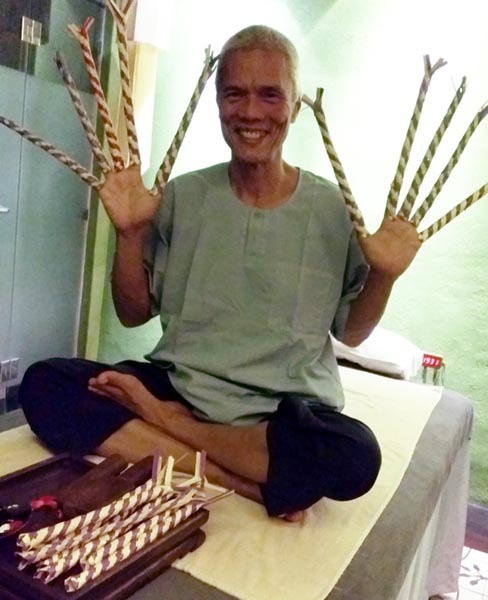 The least expensive package started at B699 for the introductory massage. 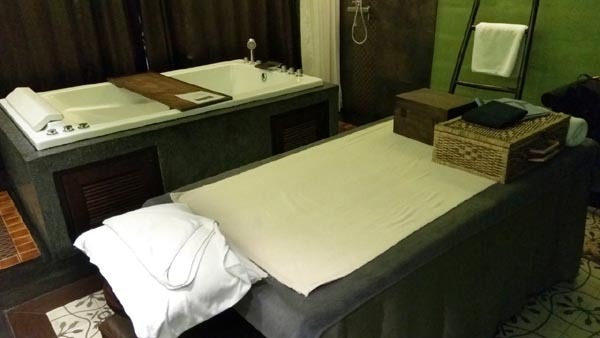 I took the Royal Thai Lanna Massage (Signature) at B2,400 for the 2-hour session. The most expensive package I saw was the 5-hr Royal Honey Moon 9-Menu at B6,200! I don't know what Mike took but I heard him say he wants oil with the massage. Cool! With that, our therapists began the ritual - foot wash first. We went in further in the palatial area to what seemed like a center garden with a pond full of giant koi. We could see the rooms and their adjoining balcony up to the 4th level. 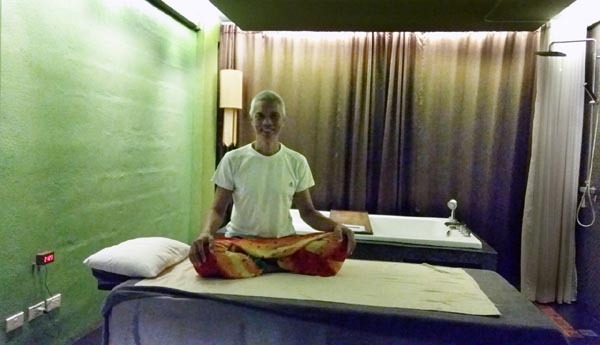 After the foot bath, our therapists took us to our individual rooms. 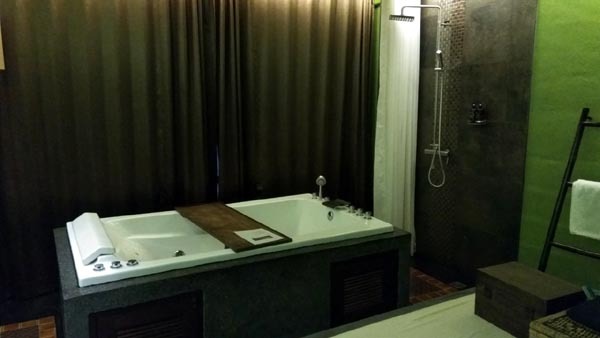 The spacious room I was in was luxurious - its own jacuzzi, shower system, toilet and yes, the massage table. Wait! There is also the key card lock! A balcony on every room? A door key card? This was beginning to look more like a luxury hotel. Hmmm....this must have been designed to be a hotel originally - according to Mike, who owns a few hotels in Chiang Mai. I wonder why it ended up as a spa resort. I wish I could describe in detail what happened, but I was so blissed out in those 2 hours as my professional therapist kneaded my muscles, stretched my limbs, twisted my torso, pulled my fingers, etc. I was in a constant state of half-dazed joy the entire time. All I know is that everything went well and I came out of it with a big smile - and so did Mike! I didn't even feel the 2 hours pass by. I guess that says it all. Let's face it. 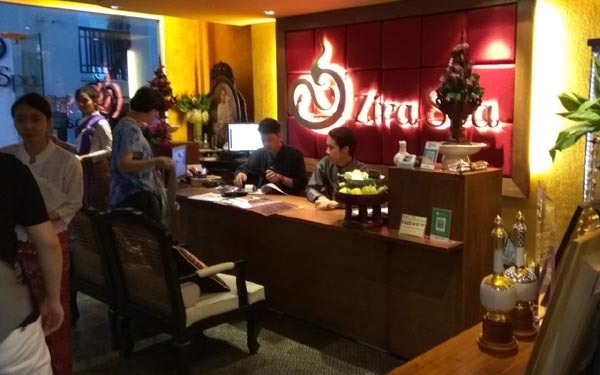 With cheap street massage you can get for B150, Zira Spa is not for everyone. But that's the whole point. 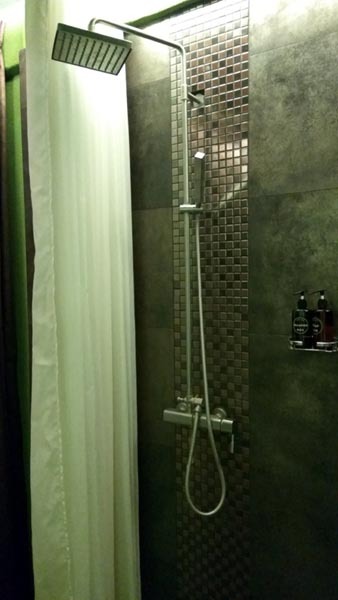 There are discriminating people out there who wish to be pampered by the best thing money can buy. 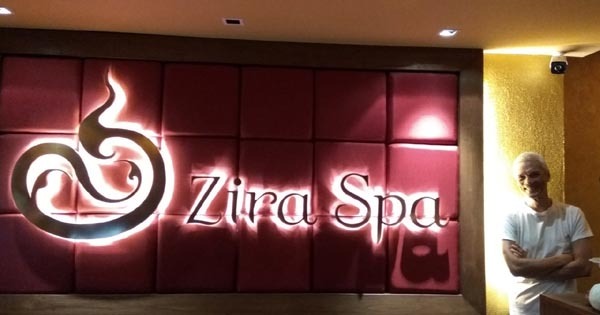 That's where Zira Spa comes in - in service, in professionalism, in amenities and in the overall package of making you feel pampered, looked-after and valued. 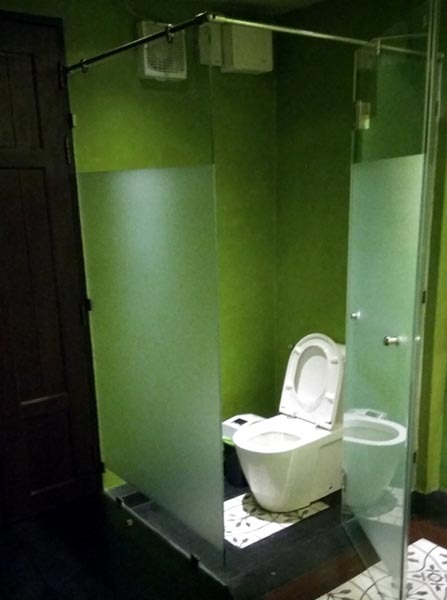 Given its perfect 5-Star rating from 228 reviews in Tripadvisor, you don't even have to take my word for it. If you have spare cash for pampered indulgence, don't look any further. 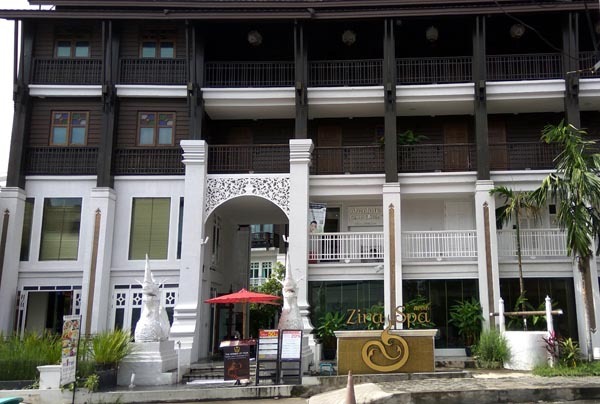 Just book a session at Zira Spa! 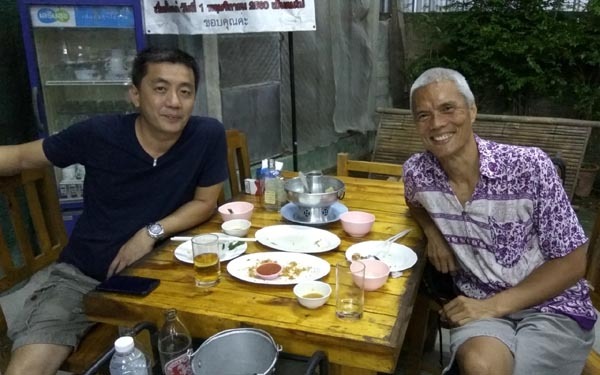 get a red cab (songthao) outside the train station for Baht 50 (instead of paying B100 if inside the train station) to Old City - if you haggle nicely enough...I did! FREE daily yoga classes from 9:00am to 10:15am at Nong Buak Hard Park (southwest corner of Old City). Resident and passing-through teachers take turns conducting yoga classes. Copyright © 1999-2019 TheLoneRider.com. All rights reserved.